Yahoo Inc shelved plans to spin off its stake in Chinese e-commerce giant Alibaba Group Holding Ltd, under pressure from activist investors worried about billions of dollars in taxes, and said instead it is looking at creating a separate company to hold the rest of its assets. The decision, following three days of board deliberations last week, is an explicit rejection of Chief Executive Marissa Mayer's plan to spin off the Alibaba stake and may cloud her focus on reviving Yahoo's core business of selling ads on its popular news and sports websites. Investors were unenthusiastic as they digested the complexity of the "reverse spin-off." "You've got a sinking ship right now," said Jeffrey Carbone, senior partner with Cornerstone Financial Partners in Cornelius, North Carolina, a former Yahoo shareholder. "Yahoo is just a company in trouble." The company, overtaken by Google, Facebook and others since pioneering the commercial web in the 1990s, said it had no plans to sell its core business, as some investors had hoped, but the move effectively invites offers for the new entity. "There is no determination by the board to sell the company or any part of it," Yahoo Chairman Maynard Webb said on a call with investors. "We believe that the business remains very undervalued, and we are focused on realizing and unlocking that value." The new publicly traded company will house Yahoo's Internet business and its 35 percent stake in Yahoo Japan, worth about $8.5 billion at current exchange rates. 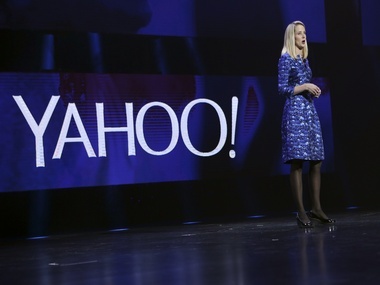 Its Alibaba stake, worth more than $30 billion, accounts for the bulk of Yahoo's current market value of $32 billion. But the creation of a new entity - which Yahoo said would take a year or more to conclude - will likely take Mayer's focus away from turning around the Internet business. Mayer's efforts have so far had little tangible effect. Revenue has fallen slightly since she took the helm in mid-2012, and Yahoo's share of U.S. web searches is essentially flat with three years ago, gaining no ground on market leader Google. "The challenges the Internet businesses face will not change because of a sale," said Murali Sankar, an analyst at Boenning & Scattergood. "Given the size and assets I think a sale is less likely, but could create tax efficiencies for the buyer if they wanted to divest certain assets." Yahoo had intended to spin off its Alibaba stake by January, but the plan hit a hurdle in September when the Internal Revenue Service denied the company's request for a ruling on whether the transaction would be tax free, potentially costing shareholders billions in taxes. Activist investor Starboard Value LP asked Yahoo in November to drop its Alibaba plans and sell its core search and display ad businesses instead. Starboard had previously supported the spinoff. Given that the new entity would be of a lower value than the Alibaba stake, that would limit the tax liability if the transaction was not tax-free, analysts said. In a worst-case scenario, the tax bill would be $5.3 billion, compared with the potential for a $13.3 billion hit from the Alibaba spinoff, Sterne Agee CRT analysts wrote in a note. Yahoo executives said on a conference call they still believed the original spinoff would have been tax-free but the spectre of a big tax bill had unnerved investors. The new plan will require Yahoo to win the consent of a large cast of players including regulators, shareholders, bondholders, business partners and others "too many to name," Chief Financial Officer Ken Goldman said on the call. The plan to spin off the Alibaba stake would have been far simpler, he added. Yahoo has struggled to grow its Internet business, which includes selling search and display ads on its news and sports sites and email service, in the face of competition from Alphabet Inc's Google and Facebook Inc. But Yahoo.com still ranks fifth in terms of daily visits, according to monitoring firm Alexa, and this could make it an attractive target for a telecom carrier or private equity. AT&T Inc and Verizon Communications Inc could be possible buyers for the Internet business, FBR Capital said. Verizon said on Monday it could look at buying Yahoo's core business if it was a strategic fit. The chief executive of CBS, Leslie Moonves, said the media company would not pursue Yahoo, speaking at an event earlier this month. Yahoo also announced that Max Levchin, co-founder of PayPal Holdings Inc, was resigning from the board because of the demands on his time, "not due to any disagreement with Yahoo on any matter related to Yahoo’s operations, policies or practices."